Our baby boy turned one last month, and we were ready to celebrate! We celebrate our birthdays a little differently than the giant mountain of gifts. Our goal is to raise good men for the Earth and to make the Earth better for our little boys. I believe that we are borrowing this world from our children, so I want to leave it better than I found it for them. For our family, that means avoiding overconsumption and trying to create as little waste as possible. So we keep it super simple. That's it. They still get more presents from family members, but I want their birthdays to be about celebration, not stuff. I want the world to be a better place because our family is in it, and this is one little way we try to minimize our impact. So, we try to approach the birthday party in the same way. We want it to have optimum fun and minimum negative impact, so this is how we do it. We use what we have, we don't use any new plastic, and we buy secondhand or make it ourselves. We skip stupid favor bags, because honestly, who cares. We also have a lot of good food, because people will forgive anything if they have happy bellies. For The Bear's birthday, we decided to do a Barnyard Dance party. Since it is in the early fall, we can have it in our yard, and we can use our own plants as a bunch of the decorations. Can I come up with a childhood's worth of outdoor party themes? Let's hope, because it is so nice to be outside. We used the food and the decor to get the theme across without going too crazy. I am no great baker, but I thought this barnyard cake looked pretty cute. I bought the farm animal and tractor decorations at Goodwill (for 3 dollars, people!) and gave them a good scrub. The other ones are from a Green Toys farm set our oldest got last Christmas. The cake is just 2 sheet cakes cut into the shape of a one. I did a from scratch chocolate recipe that I honestly didn't love, but my frosting recipe never fails (and is crazy easy without being chalk full of creepy bonus ingredients). We try to make our food really sell the theme. Partially because it's a relatively zero-waste to nail the theme (as long as it tastes good) and partially because The Boy can really rise to a cooking challenge. We made ham sandwiches, pasta salad, and a veggie plate. We bought the buns, but they did make a lot of waste because of the bags. This is a spot I would do differently if we did it again. We use our normal plates, silverware, and glasses for the party. Yes, with about 20 toddlers in and out. We give them the bubs' plates and bowls from Replay. Nothing gets broken, and even if something did, it would still be a lot less waste than the plastic silverware that gets tossed And it's like two extra runs of the dishwasher. By the end of the next day, you can't tell. We got out the recycled napkins from Seventh Generation. We used the little produce containers from the farmer's market to house a fruit salad. It was a big hit with the little kids, and I thought it was an easy and cheap way to feel farmy. 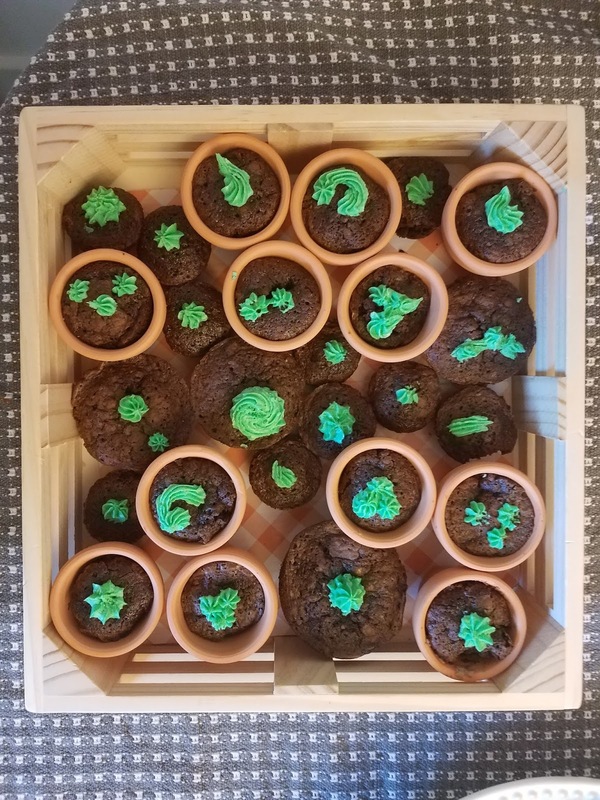 We made these "pot brownies" by making small brownies in the mini-cupcake pan. They fit pretty perfectly into these small terra cotta pots, which I will use again next summer for plants. Then I piped the same vanilla frosting on the top as stems. They got a lot of comments, and people ate all the ones that weren't in the pots. I think the pots were actually a little intimidating, so there were still a half dozen left at the end. The last thing we did that I loved were these rice krispy treats hay bales. We used the bubs Green Toys tractor. We cut the rice krispies to scale and tried to stack them to look like hay. Adults LOVE rice krispie treats (including my husband. Who knew!) so this was a big homerun for basically no effort. We kept our decorations really minimal. I have that instinct to go all out, but I find less can be more. 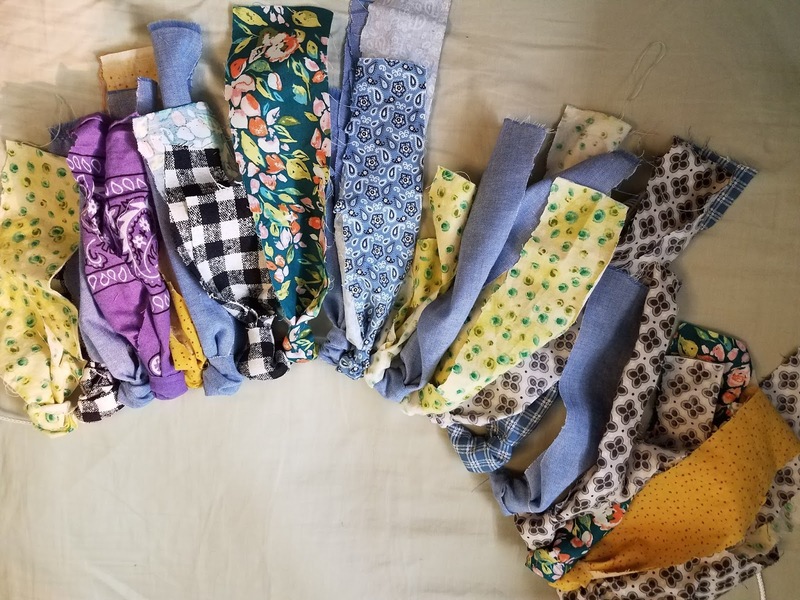 In all, I mostly reused things from home and bought a bunch of secondhand fabric scraps, so the total cost of decorations was probably less than 20 dollars. We bought a fresh copy of Sandra Boyton's Barnyard Dance for a guest book, which I promptly forgot to have people do. But I think it is a cool idea in lieu of gifts. I got a pallet from a neighbor on Buy Nothing to make a photo display, but it didn't fit in my car, so we just spread out pictures we already had on our wainscotting instead. These were printed at Artifact Uprising, who I love because they use recycled paper for their prints. Plus they just look really beautiful and high end without being fussy. I made a birthday banner (that we can hopefully reuse in the future) with felt and fishing line we already had in the house. Just cut out the letters from blues, greens, and oranges. Tie them together with fishing line or ribbon and use a little bit of scotch tape where they don't hold their shape. The tape job was all my husband. Because communication. I skipped the balloons and tried to make a banner out of fabric scraps that I bought at my workplace Seattle Recreative. This is the tutorial I (loosely) used. 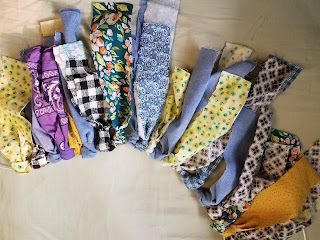 It was so easy- I just cut out scraps while we watched tv at night, and I could tie them with little ones playing around. It came out so great, and I can't decide whether to gift it forward or save it for future parties. How do you make your parties create less waste? What themes have you done for your kids' birthdays? Such a cute birthday party theme! I love how everything was setup! That cake is impressive! The birthday party looked like quite a success. That cake is amazing, well done. And I love the theme! Omg what a cute birthday party! And that cake looks amazing!